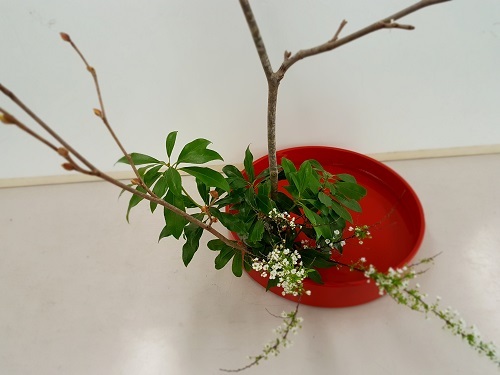 Levels one and two of the Sogetsu School of Ikebana are devoted to basics, basics, basics. Everything depends on the basics. One set of branches with one set of flowers and variations of three primary lines (Shin, Soe and Hikae) placed in different positions and slanted to different degrees. Over and over and over. Sometimes in round flat containers (Moribana) and other times in tall slender containers (Nageire). You might think of it in the same way as endless etudes for the same 88 keys of a piano. By taking classes in rapid sequence, the constant repetition gradually builds my technical skill and my confidence. No surprise that. The flowers and branches are things of exceptional beauty before we begin to manipulate them. However, creating a remarkable arrangement is hardly as simple as sticking one in at 15 degrees, another at 45, the next one at 75 and filling in the gap with the leftover leaves. A highly codified Japanese aesthetic which combines the harmony of colour and container with sensitivity to season is part of the art. Fortunately (thanks to many years of interest in themes Japanese, a good grounding from my Vancouver Sogetsu Ikebana teacher Mrs. Sally Yukawa, and the excellent chapter on Ikebana in Haruo Shirane’s book Japan and the Culture of the Four Seasons), this code is not something I need to be taught. Refine it, yes; learn it, no. When considering the parameters of a specific arrangement, nothing happens without forethought and careful attention to detail. For example, a single blossom on a branch of tight buds portends spring and suggests the future. Or white Spirea blossoms arching down might suggest branches laden with snow. Such characteristics figure as abstractions and symbols in the arrangement. On occasion I also take a pragmatic approach. If faced with a challenging lesson, I choose branches and blossoms which aren’t going to irk me. I can count on strong-stemmed flowers with abundant leaves to hold their position and cover the mechanics of the arrangement. It’s also easier to rely on flexible branches which naturally bend in the way they must be placed. So far, my arrangements consistently achieve harmony and balance as a result of my choices of materials and containers. I don’t have difficulty achieving a Japanese sensibility; in fact, some of my classmates as well as the day’s Master Teacher often comment on it. The technical elements are more challenging. Although they are becoming less frequent there are numerous misses no matter how hard I concentrate. 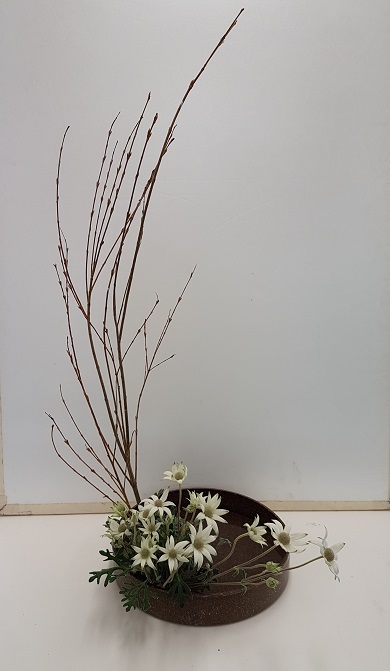 One of the primary blooms or branches is set at an angle too high or too low; it’s too long or too short; it needs to point forward not back; or if I have it forward it needs to go back. At times it’s frustrating that the two-dimensional photos in the textbook and the instructions aren’t always crystal clear in these matters. However, it’s the same for the others whatever their level—even those practicing for their upcoming teacher’s certification exam. We all get some kind of censure along with any praise. No matter. Each day, each lesson, each effort is a joy—even when it vexes me. Progress is a gradual thing. By late November one of the instructors comments on my excellent adherence to the rules. Sweet! For a moment every cell in my being glows. 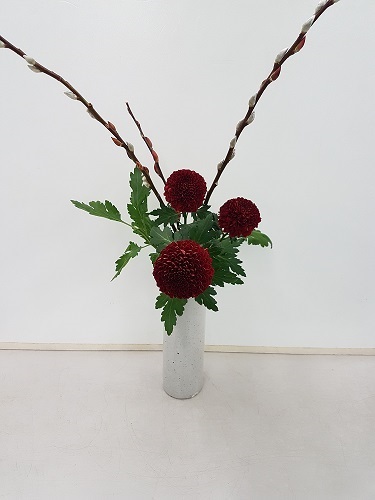 When I first started with Ikebana I glibly thought that it was one of the more ideal arts. I didn’t need a great deal of work space or equipment or have to stockpile a bunch of paintings behind furniture and under the beds. And that’s not untrue. However, I have come to learn that I dare not forget to fully savour the beauty I have created because my amateur photos are no adequate memento of the moment. The arrangement will cease to exist in little more than an hour. The teacher’s evaluation delivered, I must pull it apart and clean my work station. Quite unexpectedly, I feel an acute sense of loss that is much larger than the flowers. 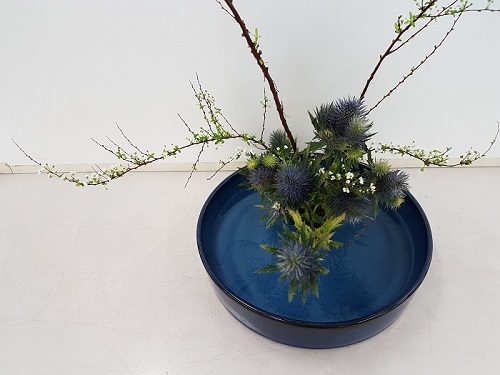 This entry was posted in Japan, Travel & Culture, This & That and tagged Level 1 & 2 Sogetsu Ikebana, Studying Sogetsu Ikebana in Tokyo. Bookmark the permalink.